Spring 2013 has seemed long and cold and whilst still cold, the days have recently been dry and bright. So on a lovely sunny and bright Friday afternoon we found ourselves heading off to the small town of Laugharne here in Carmarthenshire. Laugharne is not far from where we live and is best known as being the home of Dylan Thomas from 1949 until his death in 1953. Every spring Laugharne hosts an absolute gem of a music and arts festival and to our shame we had never been before; in fact before moving here we had never heard of it! But having gone to Hay festival last year to see Chris Wood in concert and not been impressed (not by Chris Wood who was excellent but by the whole corporate bollox) as it was full of trendy people from London having a ‘few days in the sticks’ before they rushed back to the city for a shower, a latte and the security of street lights. I really should have known better about Hay Festival as it is sponsored by the Telegraph Newspaper (enough said). 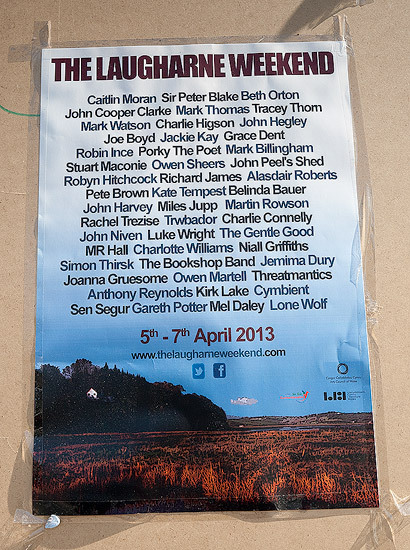 The Laugharne Weekend is the complete opposite and is clearly run for pleasure rather than profit. Laugharne very much reminds me of Kinvara in the west of Ireland and it proved extremely confusing, as I overheard in a conversation, for those from the city who did make it here. The locals had cunningly extracted all their cash from them for board, lodgings and refreshments but had failed to advise them that things like cash machines don’t exist in small towns in Wales. Not sure how they would get on where we live with no mobile phone signal either but I expect that you can get counselling for such trauma. We parked by the church and had a walk round. It really is glorious down by the estuary on such a grand day – as Beth Orton remarked in her set later in the evening; ‘It’s fecking gorgeous’ or words to that effect. After getting orientated and collecting our wristbands we headed off to the Millenium Hall where Joe Boyd was to give a talk, based around his book ‘White Bicycles’, about his time working with the late Nick Drake. Joe was pretty much responsible for a who’s who of music in the late 60’s and 70’s (He was Muddy Waters’s roadie once as well) and here he was on the pavement in our remote part of the world shouting across the road to Robyn Hitchcock who had just turned up with a guitar and who was wearing a hat like a dead cat to insulate him from the chilling air. Joe’s talk about Nick was interspersed with music from Robyn Hitchcock, Charlotte Greig and Keitel Keinig (the latter who did a very emotional version of River Man). All in all a pretty fine opener. We returned later for Beth Orton’s gig in the packed hall. ‘Oh look’, I said, ‘there’s Sam Amidon‘ who was tuning up on stage before the gig – we didn’t think he would be playing. Sam is Beth’s husband and son of Peter and Mary Amidon who are pretty well respected folk musicians in Vermont. We had last seen him last year at the Gloaming concert in Dublin with Martin Hayes and Dennis Cahill. Sam is also the childhood friend of Thomas Bartlett or ‘Doveman‘ who is another astonishing musician who has worked with all sorts of people including producing an album for Hannah Cohen whose grandfather was a friend of Dylan Thomas (I think I just went ‘full circle’ – you still with me?). To cut a long story short; Sam is a damn fine musician and I felt that he accompanied Beth perfectly with guitar, fiddle and vocals at this rather good gig in a village hall in Wales. As we had splashed out on a weekend ticket we headed back on Saturday to ‘fill our boots’ with more music and culture. This can prove to be a bit of a lucky dip in our case as we don’t pay much attention to names and celebrities; so for at least half of the ‘names’ here we didn’t have a clue who they were. But at least it’s a chance to see if anything has passed us by over the years that perhaps we should have paid more attention to. A Welsh ‘food fair’ was set up in the castle grounds and people were doing what they do at food fairs; eating and sitting around in the sun. 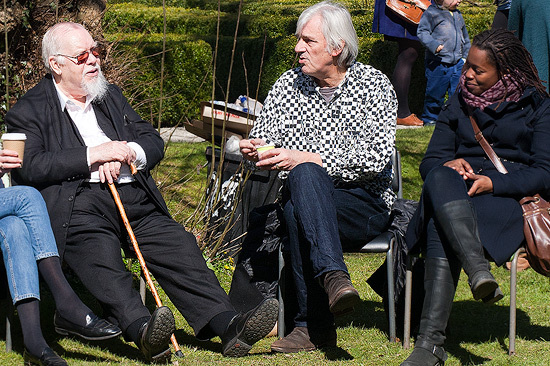 Sir Peter Blake the Godfather of British Pop Art was also waiting for his ice cream cone. And later in the afternoon Robyn Hitchcock is enjoying his ice cream. This is turning into a right celebrity ice cream festival; all we need now is John Cooper Clarke to eat an ice cream but he just seems to stick to chain smoking cigarettes. I presume that they must have run out of nicotine flavour. Time to head off to our first event which was Tracey Thorn reading some of her book ‘Bedsit Disco Queen’ and chatting about her life as a pop star. This was a weird one as I hadn’t a clue who she was until I heard her reading a serialisation of her book on the radio a few weeks ago; and very good is was too. Her reading of extracts from the book was just as humorous; she is obviously an intelligent woman who came through being a ‘pop star’ and rejoined the human race quite successfully. I’m not sure the same could be said of the ‘music journalist’ who subsequently chatted to her on stage and who didn’t seem to ask any questions that got to the heart of who Mrs Thorn was. That said it probably wasn’t helped by me not knowing anything about ‘Everything But The Girl’ or any of the records they ever made. On reflection Tracey’s writing was very much in the style of the ‘late’ John Peel. Perhaps she’d make a great presenter of ‘Home Truths’ on Radio 4? It would certainly be better than the fairly dire replacement programme now on a Saturday morning; which causes me to hurl abuse at the radio and reach for the off button in the same manner as when ‘Thought for The Day’ appears. I’m digressing too much. A quick mid afternoon sugar boost of cake was required back at the Food Fair before heading off to see someone else called Mark Watson. This was really a toss of a coin as the choice was him or someone called Caitlan Moran. Once again we hadn’t got a clue who either was but we did think that Mark Watson might be a comedian and thus possibly funny so the coin landed funny side up and off we went. Well he did turn out to be a comedian who also wrote books (he was reading from his book and trying to flog it) and yes he was quite amusing in that fast ‘smart arsed’ way that ‘comedians’ seem to perform these days. He is probably better as a comedian than a novelist from the bits I heard; and no I won’t be buying the book. The afternoon was now passing and it was getting cold on the shady side of the street. It was time for the main event to see Robyn Hitchcock in the Congregational Church. This event unfortunately clashed with John Cooper Clarke who was on just across the road in another venue; but being more ageing hippies than ageing punk rebels it was Robyn we wanted to see – particularly as he can best be described as quirky or as other might say ‘as mad as a box of frogs’ (in the nicest possible way!). He played a gorgeous intimate set, accompanied by a rather fine cello player (the lady in the ice cream picture above) to around 50 or 60 people and a similar number of Welsh midges who had flown into the church for a warm on a cold night. Robyn is very much of that whimsical English singer song writer tradition who very definitely ploughs his own furrow; who else sings lyrics like ‘I feel like a three-legged chinchilla, standing on a table so wide I can’t see over the side’? Contrary to most of the others here he wasn’t trying to flog his merchandise and very refreshing that was too. The midges also seemed to have a particular affinity for Peter Blake’s hair, which was also fascinating to watch and certainly made for quite a surreal evening. How many other people have sat, in a Welsh chapel, by an ‘icon’ of the Pop Art movement watching a cloud of insects hop around his white hair whilst a quirky British eccentric sang ‘ River Man’ (written by another eccentric) in the wrong time signature? Evenings like this (mosquitoes excepted) don’t happen too often in our part of Wales. So Sunday dawned, not quite so bright but still acceptable by Welsh weather standards and we headed back for the the last day of the festival. It has proved to be quite the best little festival we have ever been to in the U.K. and I hope it remains so and avoids the trap of getting too big and accepting the money of corporate sponsors. Sunday couldn’t be any better could it? Like most weekend festivals Sunday is a more chilled and relaxed affair. A time for recovering from any excesses the night before etc. So we decided to go along and see what Sir Peter had to say about Pop Art and ‘that’ Sergeant Pepper Cover. 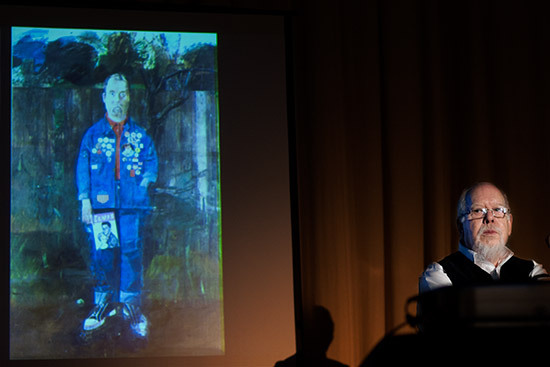 Sir Peter Blake at Laugharne with his painting ‘Self Portrait with Badges’ or my shot of ‘The Artist with Himself Looking Over his Shoulder’. Now most art goes ‘whoosh’ over my head so this was an interesting hour or so as he chatted to Mark Ellen (remember him from the ‘Old Grey Whistle Test’?). On the way in to the hall they had been selling some raffle tickets and Liz said she’d buy one to help support the festival. I suggested that she wait for the seller to come to her; as good fortune would be more likely to come to her (rather than go chasing it). 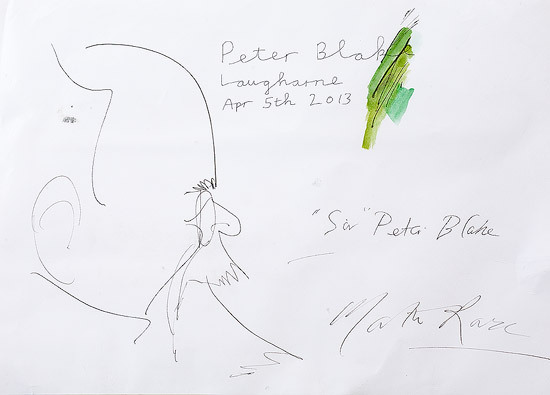 The event came to an end and the winning ticket was drawn……..drum roll…….ticket number 45…….yes we were the winners of a cartoon of Sir Peter Blake drawn by Martin Rowson of the Guardian and signed by Sir Peter. So now we have a Rowson and Blake on the Wall or at least we will have once it has been framed. Edit: Since posting this Martin Rowson has kindly commented on the blog and explained how the cartoon came into being; which probably explains the bit above Sir Peter’s ear; which now turns out to be a portion of refried beans – not a carefully considered dash of the pen. I do wish we had gone to see Martin now as anyone who can write ‘Is God A Hedgehog‘ is O.K. by me. We drove home in the weak sunshine asking each other if that weekend had really happened or did we just dream it? Glad it’s got a good home! 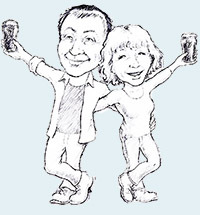 I just gave it to the Festival for them to do with what they chose, and it was drawn in about 2 minutes in the Tex Mex restaurant on Friday night at a time I was already sinking below tsunamis of red wine. Good likeness, though. And if you’d checked your programme you could’ve avoided Mark Watson & come and seen my gig in the Rugby Club. Next year, next year, and long may the cartoon bring you joy! Previous Previous post: A Second (or perhaps third, fourth or fifth) Rate Country?